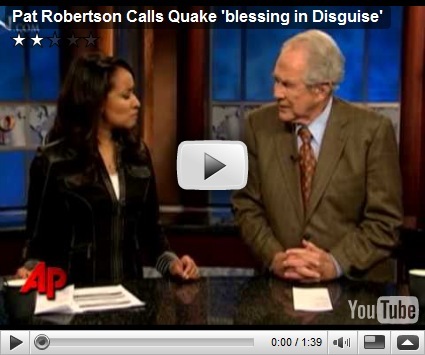 Pat Robertson at one point in the video intimates that the earthquake might be a ‘blessing in disguise’. Then he goes on to talk about how Haiti in the past ‘made a pact with the devil’ in order to get free from the French and that the curse of God is still on that nation. Somehow according to Pat the earthquake could be a ‘blessing in disguise’ if the nation turns to God in the midst of the tragedy. What do you think about what he said here? His comments are all over the news and the internet and have become an embarrassment to the Christian community. I have already heard of several atheists making an issue of it. Did Haiti literally make a pact with the devil? I don’t know one way or another. It is the poorest country in the Western hemisphere and nothing ever seems to go right for them but there is also a lot of Christians in that land. Even if Pat believed that he prophetically received that understanding from God it was not necessarily something he should have shared in the way that he did. Obviously not wise at all. I can see little good coming out of such a ‘revelation’ at this point. It is tantamount to kicking someone who is already down. Understandings like this should probably be shared privately with missionaries and Christian leaders that serve there instead.